Together with contemporary portrait photograph. Margaret Oliphant (known as "Mrs. Oliphant"). British (Scottish) novelist. ALS. 4pp. 12mo. (Approx 5.5 x 3.5 inches). Windsor. 17th April [no year]. To [William] Woodall. "I take it for granted from the receipt of so many lists of houses that you mean to commission us to look for a 'Town Residence' for you. We accept the commission with the utmost enthusiasm. In short we shall like nothing better than to furnish it also, according to the most advanced rules of art. (Taking care that there shall be two or three spare bedrooms). Your carriages and horses I suppose you will look after yourself. But I beg to assure you that no pains will be spared by cousin Annie and myself to secure you a perfect establishment and "mount" your mansion in the most satisfactory manner. If you wish to go still further it has always been one of my favourite ideas to get up a competative examination of ladies for the situation of (let us say) consorts to gentlemen in distinguished positions. I should like to set the papers for a popular Member's wife. Please add this to that other commission - and perhaps you would also like a secretary while I am about it? I feel that if I succeed in discharging all these important tasks to your satisfaction, it will give me an opening to quite a new trade - a sort of General Agency of a higher class than ever yet attempted - for I hope and believe that you would reccomend me to your friends. And so, to be serious, your poor old wretched sham-opponent is dead! It is pitiful - Do you not feel a pang of compassion, you honourable, prosperous men, for the unfortunate humbugs, the sad lives, that have nothing to justify them for having been? It seems to me there is nothing so mournful in the world. 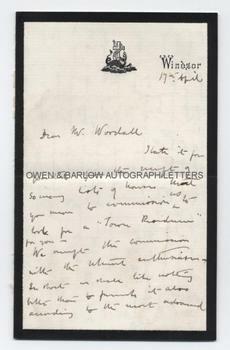 We hope you will condescend to come to see us sometime and bring us news of the great world - With my hearty good wishes." With the post-script: "Could you send me the address of the people from whom the light champaigne you recommended to me came? I have mislaid it." Old mounting traces to left edge of last leaf, else fine. 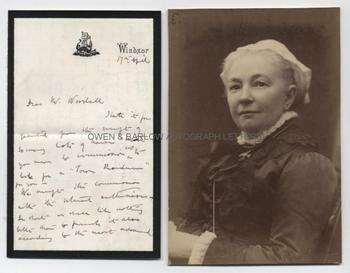 The photograph of Margaret Oliphant is an original cabinet photograph (approx 5.75 x 4 inches) by H.S. Mendelssohn. The picture has been lightly trimmed to fit an album and has mounting damage to verso but the image is in fine condition. An excellent letter and portrait, both from the 19th century collection made by the radical Liberal M.P. and woman's rights campaigner, William Woodall. 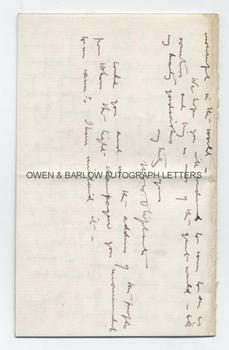 Margaret Oliphant lightly goads Woodall for enlisting her help in finding him somewhere to live in London. This was probably after he had been elevated to the Cabinet in Gladstone's government as Financial Secretary to the War Office. Cousin Annie is the novelist Annie L. Walker who went to live with Margaret Oliphant in 1866 as her companion and housekeeper. Mrs. Oliphant was a remarkable character, supporting herself and extended family after she had been widowed at a young age in 1859. 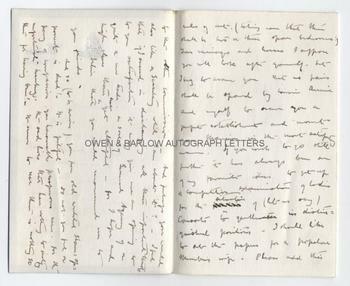 Her life thereafter was marked by incredible industry and constant tragedy and it is surprising that she managed her affairs with such grace and wit, as that which is demonstrated in her letter to Woodall.